20C Pair of Irish Porcelain Beleek Mugs. Lovely pair of Irish porcelain Beleek mugs. Bought directly from the Bellek Factory Store in Co. Fermanagh. 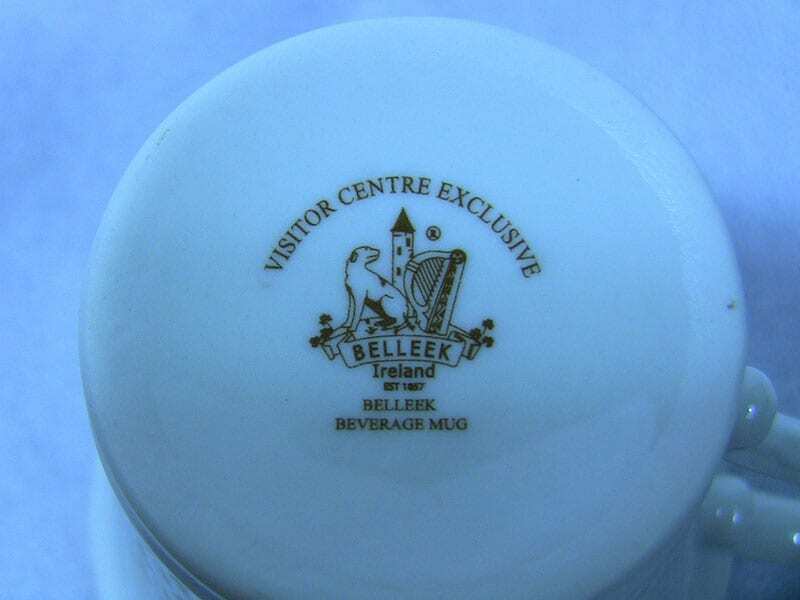 BELEEK POTTERY: Belleek Pottery Ltd is a porcelain company that began trading in 1884 as the Belleek Pottery Works Company Ltd in Belleek, County Fermanagh, in what was to become Northern Ireland. The factory produces porcelain that is characterised by its thinness, slightly iridescent surface and that the body is formulated with a significant proportion of frit. Pottery in the region began around 1849, after John Caldwell Bloomfield inherited his father's estate. Seeking to provide employment for his tenants, who had been affected by the Irish potato famine and, being an amateur mineralogist, he ordered a geological survey of his land. On finding that the area was rich in minerals, Bloomfield went into partnership with London architect Robert Williams Armstrong and Dublin merchant David McBirney. In setting up a pottery business, Bloomfield managed to get a railway line built to Belleek so that coal could be delivered with which to fire kilns. Building started on the pottery in 1858. Initially starting with domestic products, it wasn't until 1863 that small amounts of the Parian porcelain for which Belleek is famous for to this day, was successfully produced. By 1865, the prestige of the company had increased enough that its market included Ireland, England, the United States, Canada and Australia, and clients included the Prince of Wales, Queen Victoria and the nobility. Provenance: Bought at the Beleek Factory in Ireland. Condition: One is mint and one damaged/repaired....priced accordingly.